I attended a media dinner at Firehouse Subs in Woodbury, Minnesota. However, this was no typical media dinner. Nope, this was a warm, get to know you, learn about the organization, and it’s commitment to the community, and of course, eat great food media dinner! I am not one to turn down an opportunity to eat a great sub sandwich. I also have a background in non-profit, so great food and a commitment to giving back speaks to my heart as well as my stomach. With subzero temperatures and ice laden streets, I find it hard to leave the warmth of my bed during the weekends in Minneapolis. If I am going to leave the house and put on four layers of clothing it better be for a freaking good brunch! 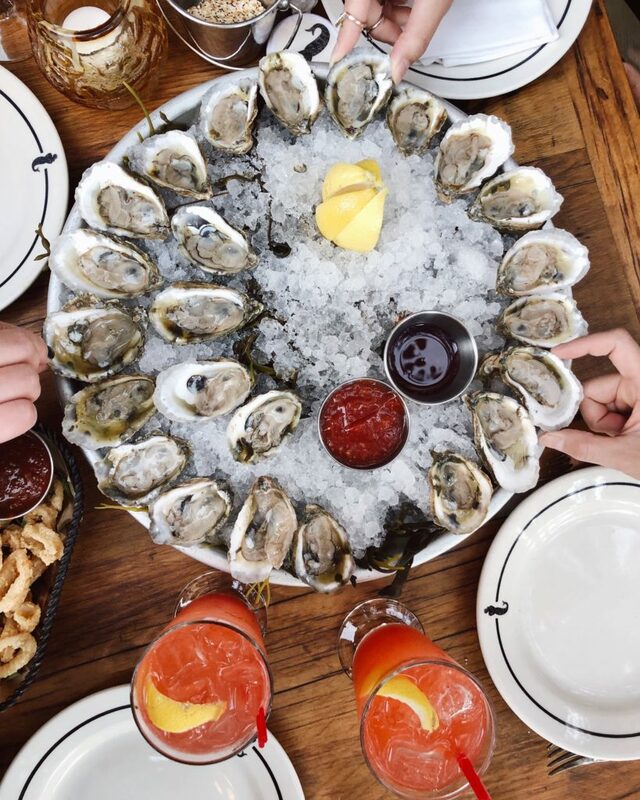 The ambiance, the food and the cocktails have to be on point and worth braving the temps. 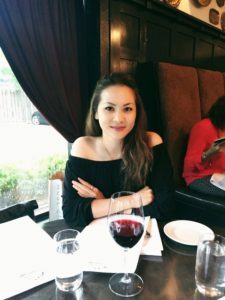 Well, last weekend I layered up and found myself at Tullibee, the restaurant at the Hewing Hotel, a new “low key luxury” hotel in the North Loop. 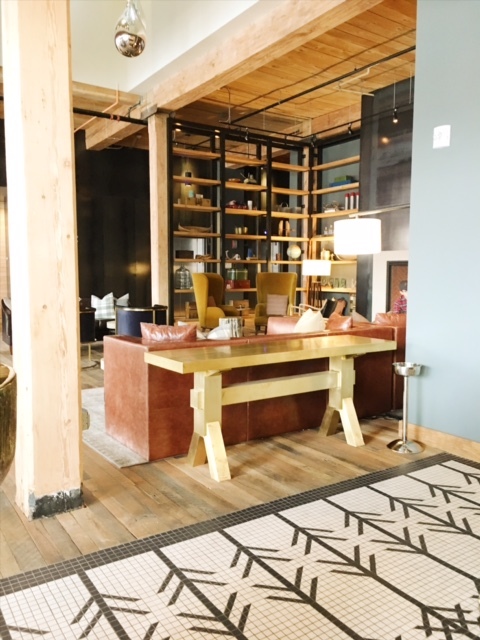 The independent hotel is designed for travelers who seek an “up north experience” within Minneapolis. It has become quite the night out hot spot. Tullibee at the Hewing is inspired by Minnesota’s lakes and woods. Not only are they the place to be for evening cocktails, I had also heard rumors of a delicious brunch. Since a good brunch will get me out of house in the winter I just had to check it out. From the minute you step inside the lobby you get the up north vibe. The woodsy, urban chic feel is comforting and welcoming during the throes of winter. If you know me well, you know my running restaurant list. My must tries of the week and those options that have been on there for far too long. One of those options just had to come off my list last weekend. It was finally time I got myself into Corner Table. 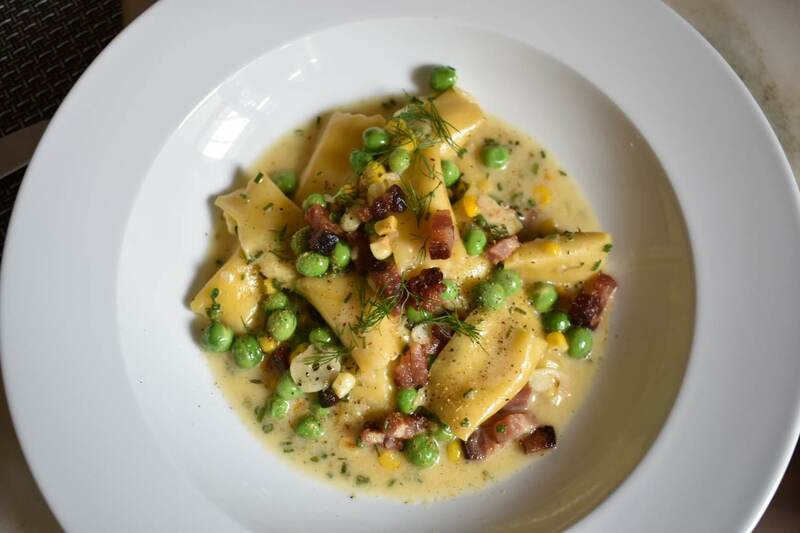 Corner Table is one of those restaurants in Minneapolis with a cult following, a celebrity following even. They have taken that following and opened other spots, like one with three hour long lines for a table. Three hours well worth it. You won’t even remember the wait after eating there. So as you can tell, the anticipation for my trip to Corner Table had been building and building. I was so ready. 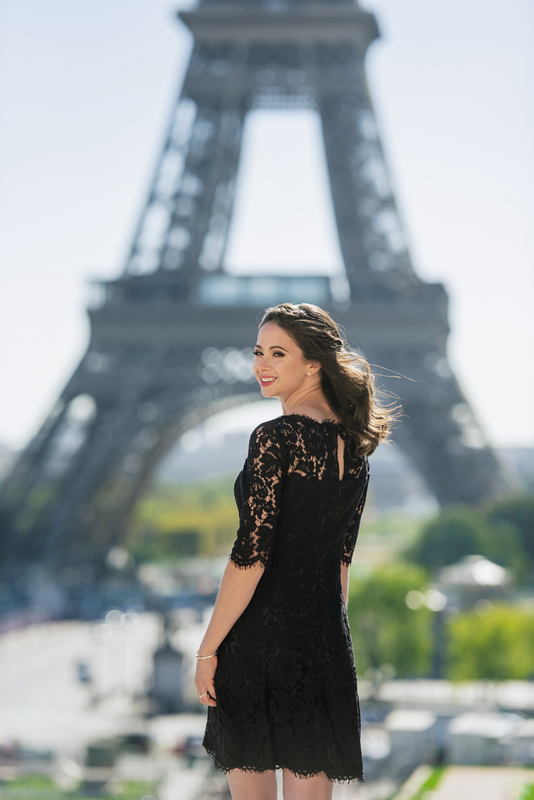 Upon arrival, the space made me feel like I was walking into an elegant but cozy home. The funky wallpaper, the trays lining the tops of the walls, the deep wood of the tables, and the lively chatter of patrons enjoying the view from the bar into the kitchen; all made me feel like magic was about to happen. My anticipation was totally at its peak. 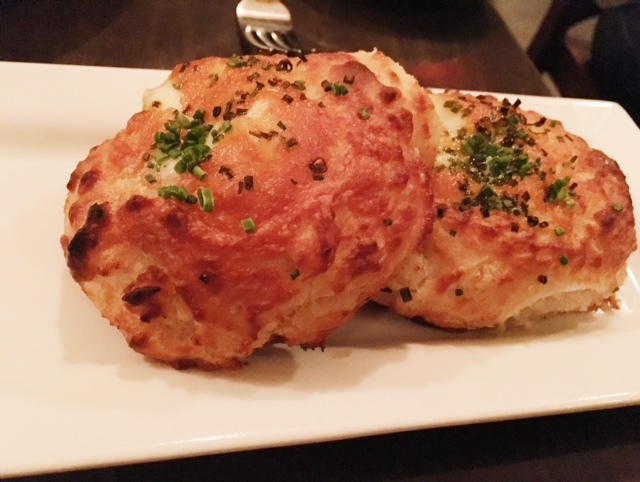 As we looked over the menu, our server clued us into the off menu cheddar drop biscuits. Apparently, the biscuits were previously a menu stable, then removed and still so popular, that they are still made every day. I mean who would I be if I did NOT order them! Holy cheesy, flaky, doughy goodness. I considered ordering more to go… We ordered these with our main course, and I may have finished mine before even trying my entrée! 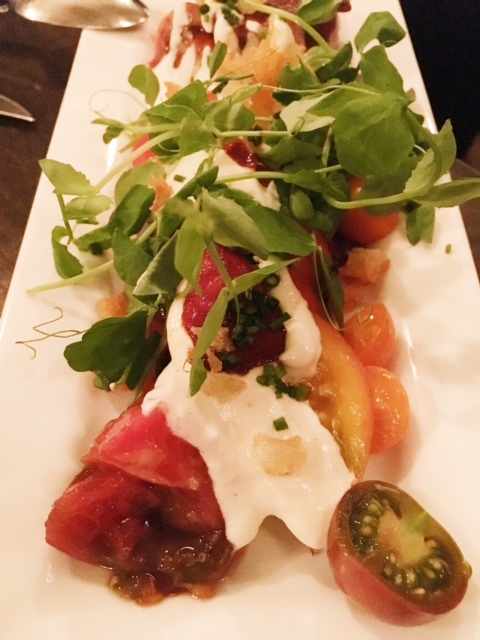 Our first starter had to be the heirloom BLT salad with crispy ham, goat cheese fonduta, and sherry. Summer does not last long in Minnesota, and I just have to get my heirloom tomato fix. The tomatoes were like candy; there was a crunch from the crouton and saltiness from the goat cheese. I think our server caught me scraping the plate. 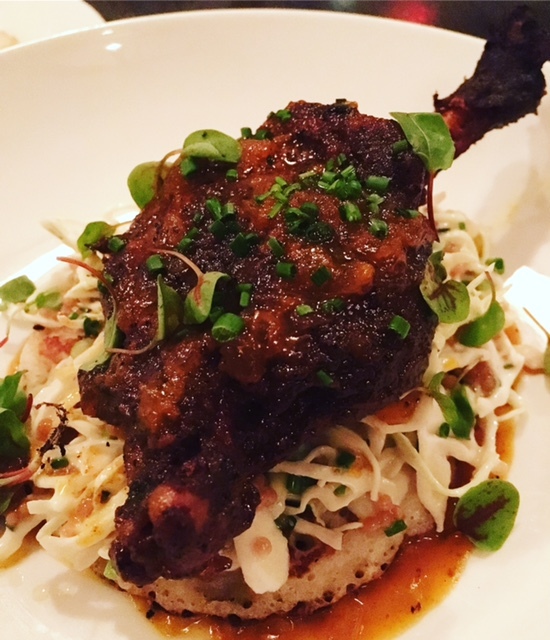 Next up was the barbeque duck leg with corn cake and green garlic slaw. The plate itself was beautiful; the sauce had just the right amount of tang and the meat was juicy and tender. I could shed little happy tears over this duck leg. Do not overlook this when ordering your meal. 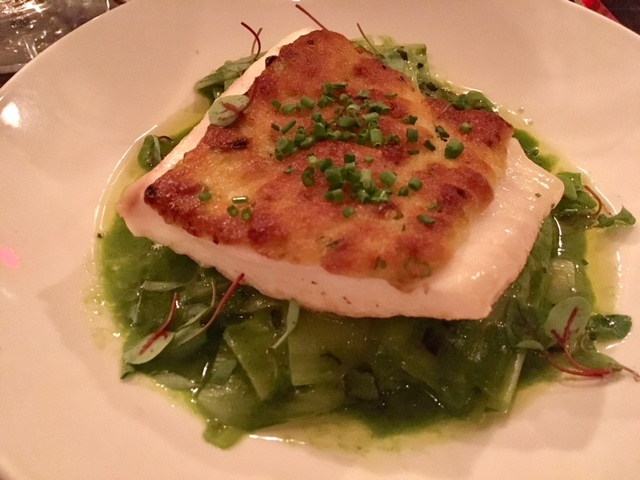 For my entrée, I went with the green garlic crusted halibut with baby leeks and black truffle fondue. My tears of joy could just continue throughout this meal. I mean the crust on this halibut was just heavenly. Just look at that golden color. The best piece of halibut I have ever eaten. My dining partner ordered the pappardelle with duck heart ragu and wild mushrooms. 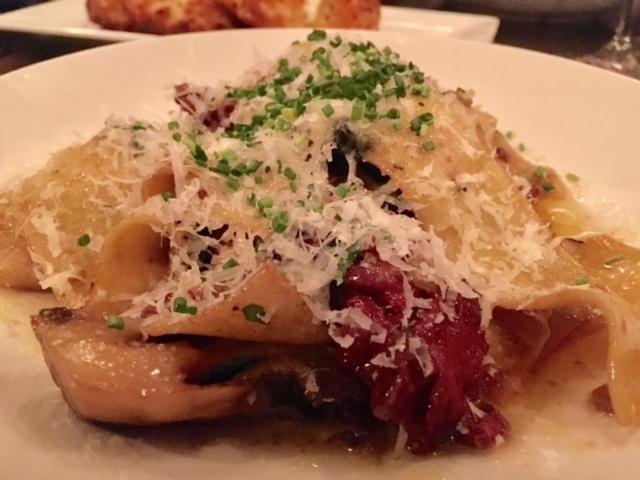 The pappardelle was a bowl of earthy, meaty, rich pasta perfection. If you are looking for that perfect “savoriness,” you’ll find it in this dish. I had the highest anticipation and expectations when walking in. I left with those just blown out of the water. It was a total sin for me to wait so long before trying Corner Table. It will not be so long before my second trip. 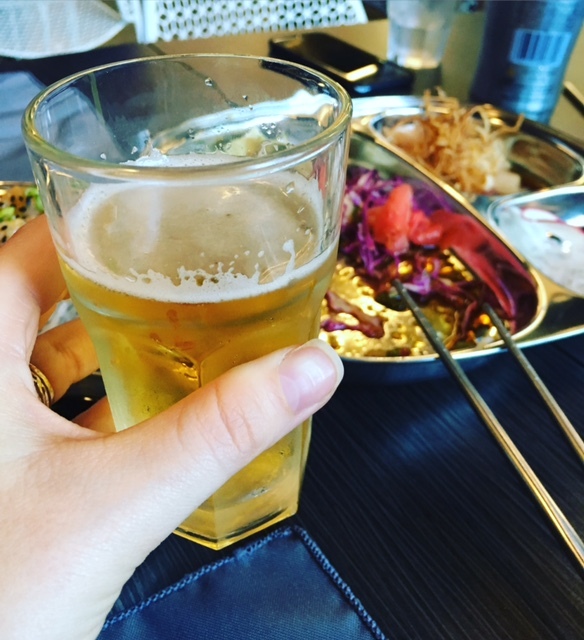 After moving to Tokyo in the second grade, I became obsessed with all things Japanese food: big bowls of noodle heaven (slurping encouraged), gyoza after gyoza, and – of course – sushi. Once we moved back to the states, my love of Japanese food never dwindled. I am always on the lookout for authentic spots. When I heard that a new Japanese street food concept had opened around the block from my old northeast apartment, I was there as fast as I could be. PinKU came to be out of the culmination of a lifelong foodie’s dreams and a sushi chef’s passion for authentic Japanese. Both owners aspire for PinKU to be a national brand, and after my experience, I have no doubt they will succeed. The space is small but welcoming, with an open kitchen on display. Their concept is based on providing high-quality sushi at an accessible price, and ties in culture, art, and education. 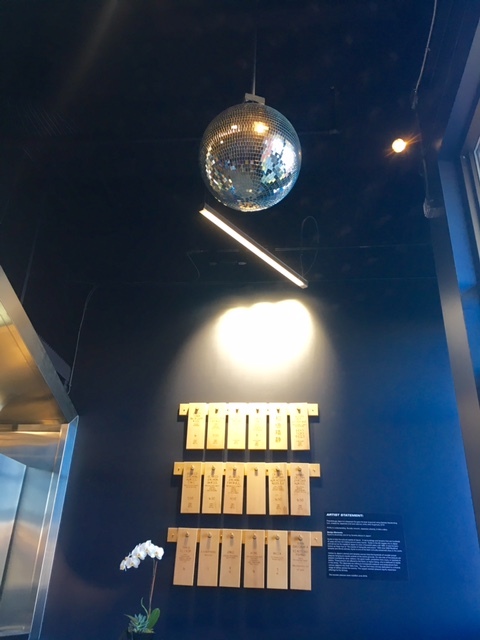 I can get all the way behind that concept and I’ll eat dinner under a disco ball any day. Sapporo begins many a meal for me and I mean here, it is necessary. As soon as we entered we were warmly greeted and walked through the menu. The menu only has eleven items, but according to our warm greeter, PinKU makes each one better than anyone else they know. 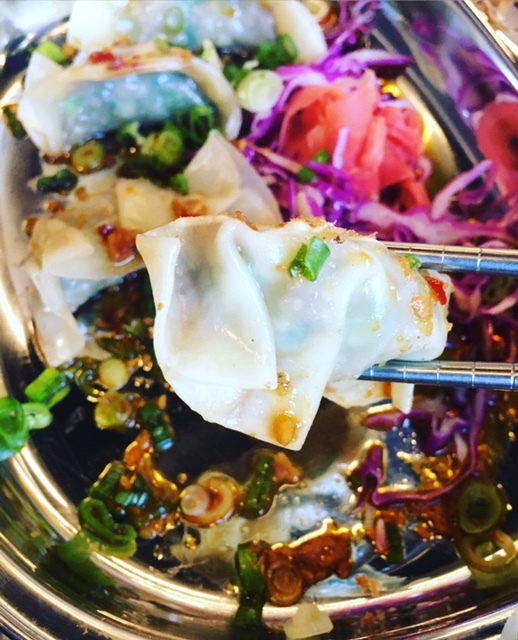 As mentioned above I can eat a ton of gyoza, so we had to try out the crispy pot stickers. They were absolutely as good as they looked. The ginger garlic sauce, the green onion and crispy exterior all sang a beautiful harmony in my mouth. I will be getting a bigger order next time! 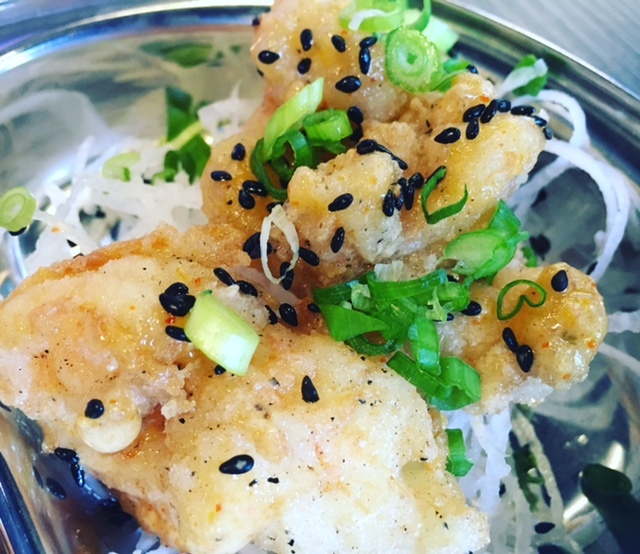 The jumbo crispy shrimp over radish noodles was recommended to us as THE item to order. I cannot describe how delicate these were. A beautiful, simple yet melt in your mouth perfect bite of shrimp. I immediately ordered another round! 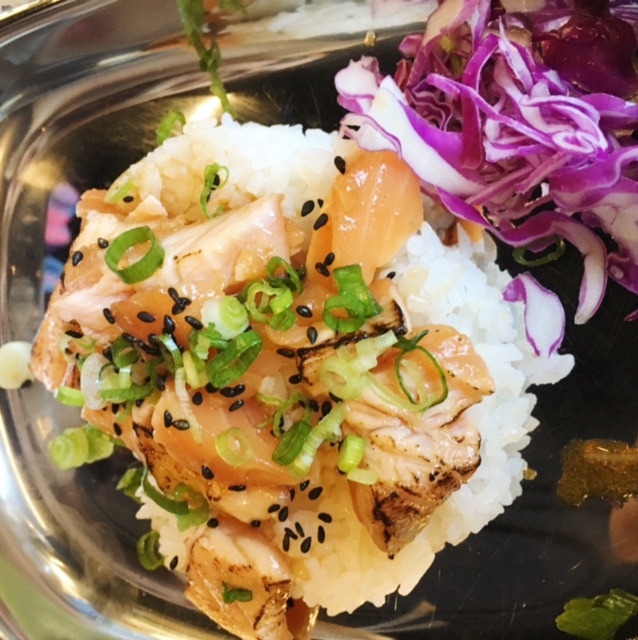 The seared salmon on rice is another melt in your mouth dish. You can taste the quality and attention to detail here. The salmon is a bite into PinKU’s claim that they make these items better than anyone they know. I am a believer! 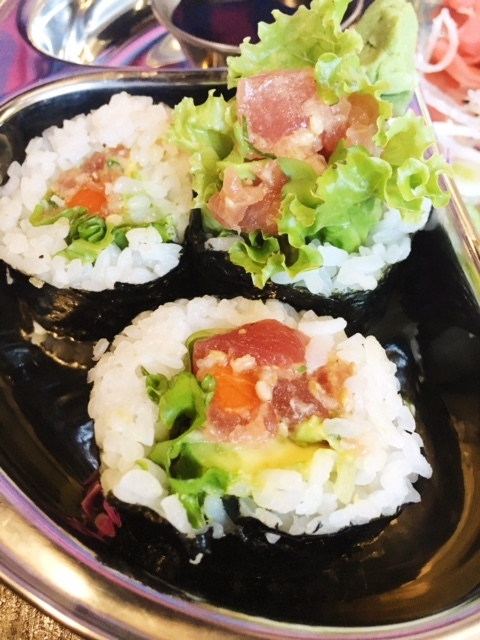 Finally we had the spicy tuna fat roll with avocado, carrot, radish and leaf lettuce. How does it differ from other sushi you ask? The fat roll is just that – fat! More deliciousness to struggle to fit in my mouth. But the bite is worth the struggle. I’d order the fat rolls all day long. Just keep em coming. PinKU definitely brought back memories of my time in Japan. They are living true to their concept and serving up their beliefs. Check them out them out if you are in or visiting Minneapolis. I’ll be encouraging them on their journey by ordering so much more of that crispy shrimp. Diners make me think of classic, hearty, stick to your ribs, enjoy the grease and eat with gusto meals. I think of worn-in but loved counter stools, servers who have seen years come and go and know all the regulars by name. And when I heard that an original 1957 Fodero Diner had traveled from Gibsonia, PA to Minneapolis, MN, I had to check it out! 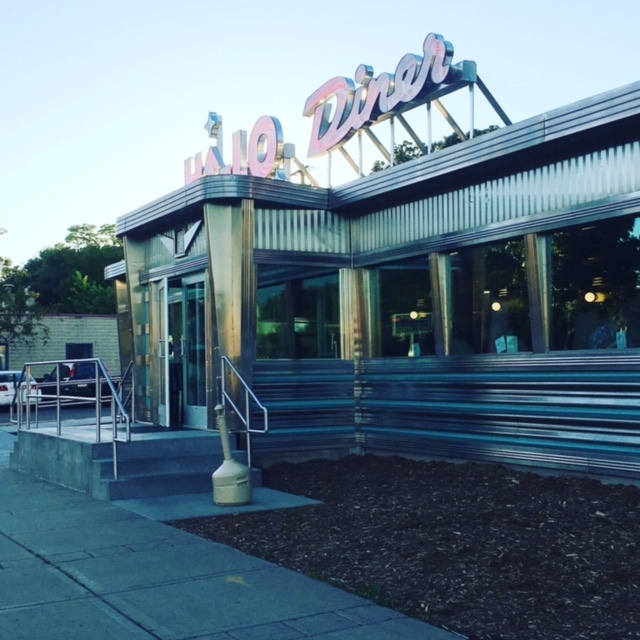 The hype around Hi-Lo Diner had Minneapolites lining up around the block. Lucky for us, we ventured in a little after the regular dinner hour and found seats right away. I loved the crisp, clean feel of the interior with the turquoise blue booths. It may lack that worn in feel, but it’s a diner alright! A diner whose weekly specials are heavily influenced by classic movies. They also have a fun cocktail, beer, and wine list; and by fun I mean ICE CREAM Cocktails! What could be better on a summer night? We ordered the Periscope Down, which is Fernet Branca, 1919 Root Beer, and cold press. 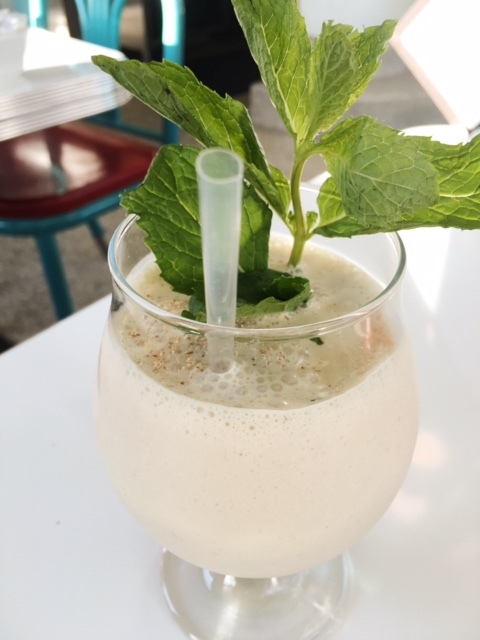 The mint wasn’t overpowering, and all the flavors blended nicely. 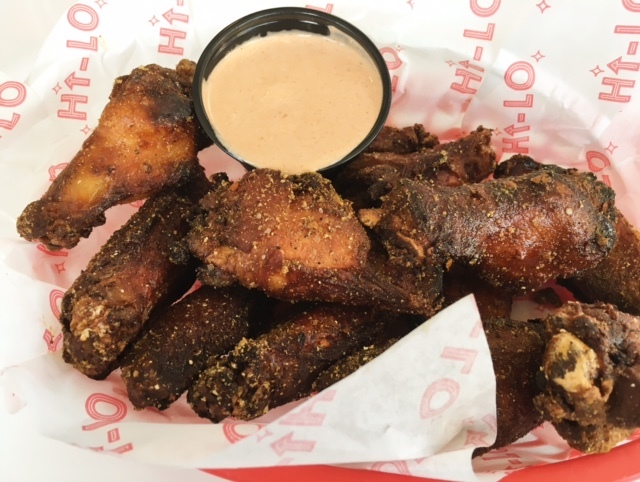 To start, we went with the “Also” portion of the menu, the only item there being the Hi-Lo Wings. I could smell these babies coming. They were some of the most fragrant wings I’ve ever had. They brought back memories of eating Jamaican jerk chicken. They are a must try. Next, I went with one of their Hi-Tops. What is a Hi-Top you ask? Well, apparently it’s like a donut, but, not a donut. Fresh, made to order, fried dough topped with sweet and savory items. I ordered the Gary Coop’er, which had me falling in love at first sight. It’s a beaut! 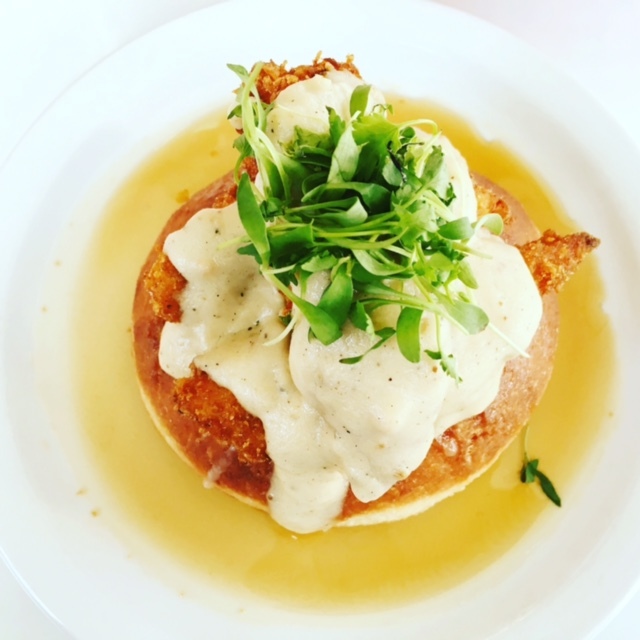 This Hi-Top with buttermilk fried chicken, bourbon maple syrup, country gravy and micro arugula was a sweet and savory match made in heaven. Finally, the country style meatloaf is exactly what comes to mind when I think of diner food. 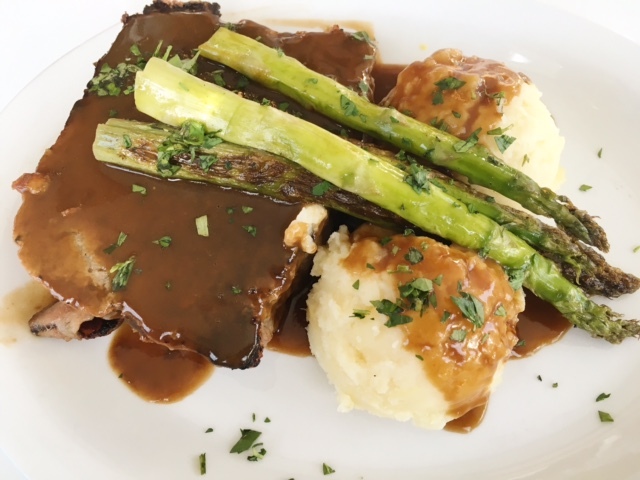 With notes of thyme, onion, garlic and dried cherries; the meatloaf comes with mashed potatoes, beef gravy, and asparagus. This is a hearty, stick to your ribs, eat with gusto type of a dish! I almost wished my dining partner and I had switched plates; this was delicious! There are a number of other items I’d like to try, and we did not even get to the pie menu! Next time, the peanut butter chocolate pie will be all mine 🙂 Check out Hi-Lo for a Minneapolis diner experience! Getting Surly in Minneapolis: Surly Brewing Co.
Flashback to a couple of weeks ago; Mother’s Day was fast approaching, and we wanted a “destination” so to say for the occasion. With my mother’s love of beer in my back pocket, planning a day for her was not a difficult task. It was the perfect excuse to check out a popular beer hall in the Minneapolis scene. Our celebration took us to Surly Brewing. Not only does this place have 20 rotating beers on tap, but the food has reached legendary heights in this town. The space is huge; you can eat, drink, take a tour and enjoy the beer garden. Surly has a beer hall, restaurant, and the Brewer’s Table; a chef-driven craft-beer inspired restaurant that brings the range of the pint to the plate. For Mother’s Day, we chose the Beer Hall. The food surpassed the legendary tales I’ve been told. 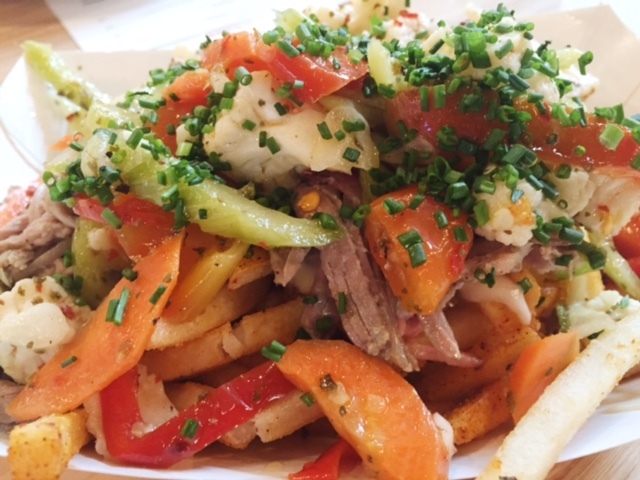 Hello, Hog Frites. The frites are a must! They are piled high with smoked pork, giardiniera, and pepper jack fondue. The meat was juicy, the fries salty and the fondue and heat from the pickled veggies a perfect combination. I admit to scraping the fondue off the basket with the last remaining fry. No regrets. 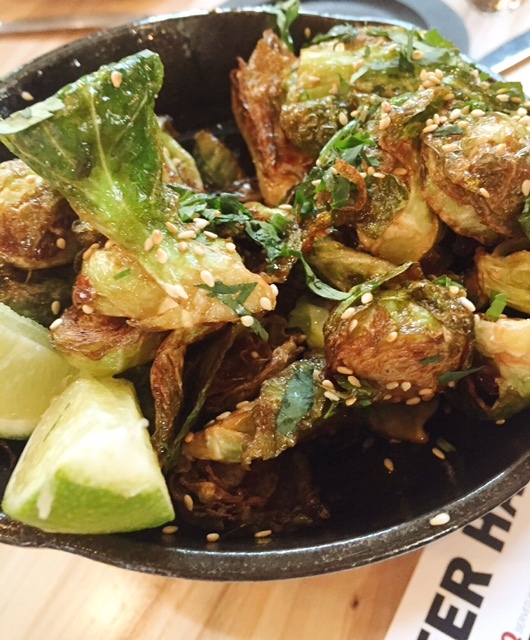 My mom would never have guessed five years ago how strong my love of brussels sprouts would be, but these days I’m ordering them everywhere. 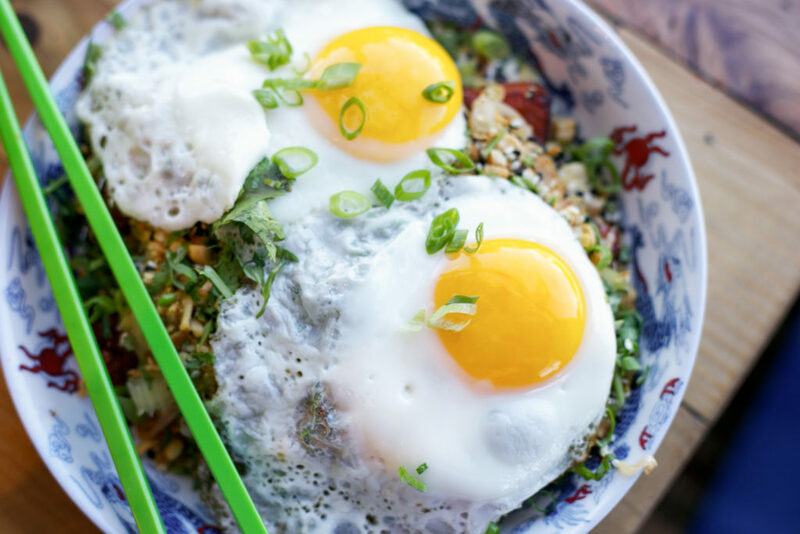 Surly’s are served with toasted sesame seeds, Thai vinaigrette, and cilantro, yum! The fish tacos are the Surly special. Fish tacos in Minnesota you ask? 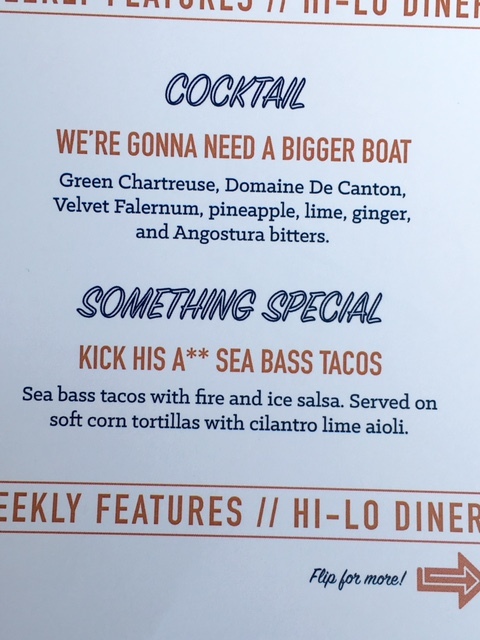 Have no fear; I’d put these up against just about any other fish taco. 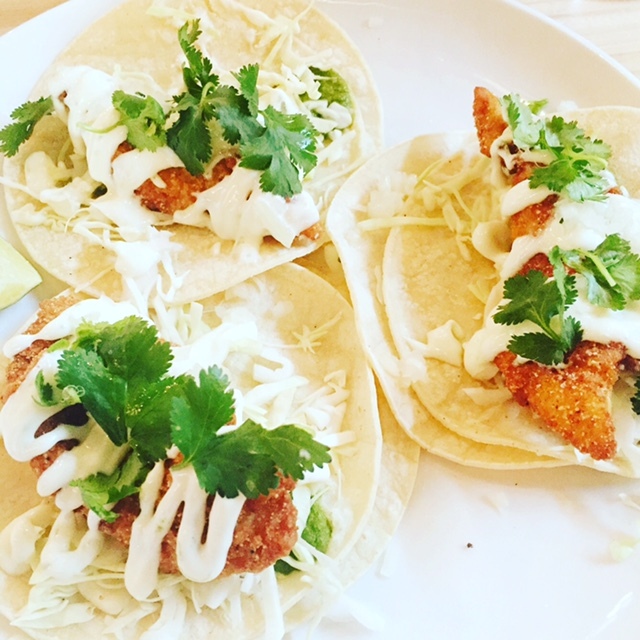 Flaky fish, crunchy batter, pickled onions and light lime aioli; they are exactly what you want in a fish taco. A sip of the paired beer and you’ll thank me. 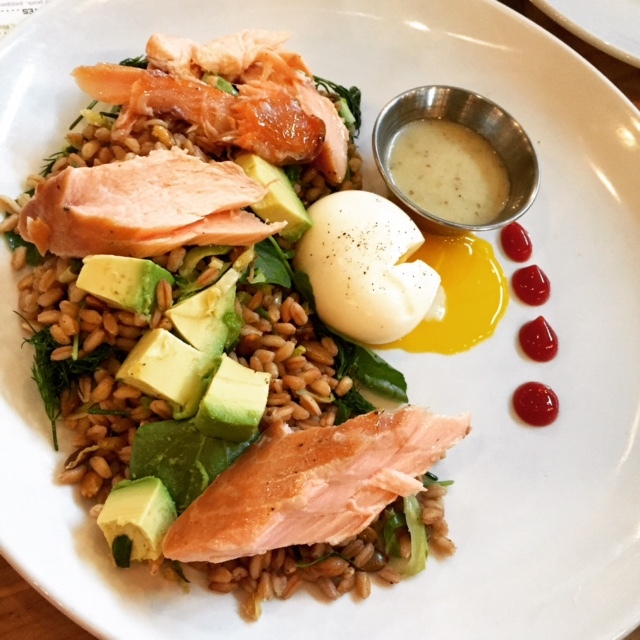 I could not get enough of the faro salad with smoked salmon, avocado, a soft boiled egg, pepitas and a lime vinaigrette. Not only was this plate beautiful, but it is also truly the perfect summer dish. 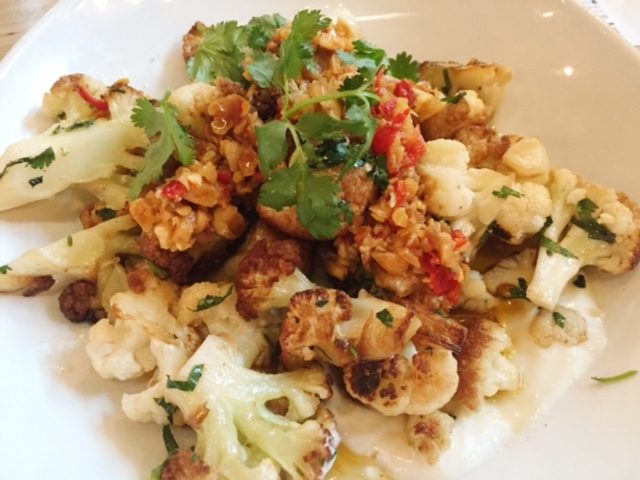 By far the smoked cauliflower dish was my favorite. It was beyond worthy of scraping the plate. The dish was composed of labna, pickled chiles, Marcona almonds and olive oil. I had to google labna during dinner! For those like me who were in the dark: labna is a creamy like cheese made by removing excess whey from salted yogurt. It may now be my favorite thing ever! If you are in the mood for a burger, I hands down recommend this one. 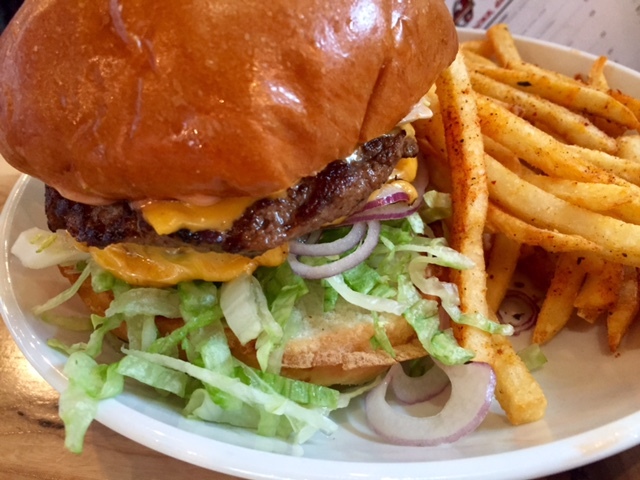 Just don’t try to modify it, substitutions are not allowed 🙂 The Surly burger is served with American cheese, lettuce, pickles and fancy sauce… an homage to a certain fast food classic if you ask me. Get ready for those double patties. If you are looking for a destination brewery, Surly is your Minneapolis spot for beer and great food!